Advantagement has performed a SmartInspect of 1 (one), Explanted FMP NETRAL METAL/METAL LINER – 34mm, Part Number: 499-34-007/012P; in accordance with SAE AS9102 First Article Inspection Requirement. This work was performed under Contract with Purchase Order. Advantagement uses the advanced hi-accuracy 3D White Light Scanning (WLS) technologies and state-of-the art engineering software applications combined with our deep expertise in precision product design, engineering and production to perform the 3D scanning, Computer Aided Inspection and Product Modernization process. The explanted part shows very little visible wear and several small nicks around the perimeter of D1. The measured size of D1 was 1.536002 inches, which is 0.002298 inches under nominal and 0.001298 inches under the tolerance limits set by the blueprint. This dimension is non-conforming and the component should not have been used. The undersize condition of D1 coupled with an oversize condition on the poly bearing made an unsound fit. Radius D2 was 0.02656 inches, which is 0.00656 inches over nominal and 0.00156 inches over the tolerance limits set by the blueprint. This dimension is non-conforming and the component should not have been used. The size of this radius plays a key role in holding the metal liner in place in the hip implant assembly. 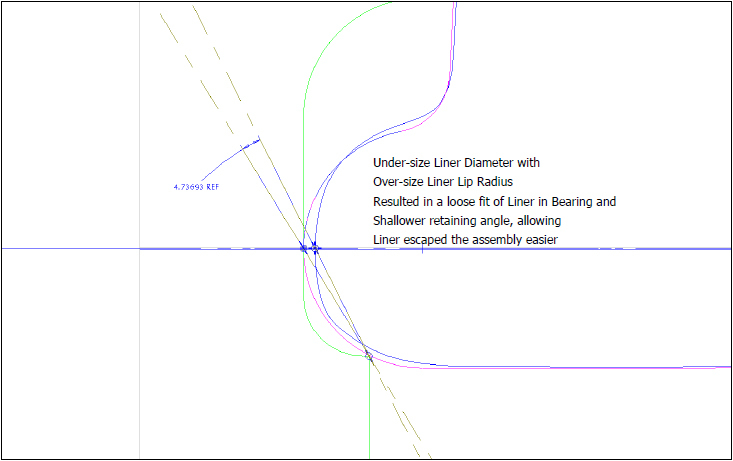 The undersized condition of several of the dimensions relate directly to the fit of the liner in the implant assembly. 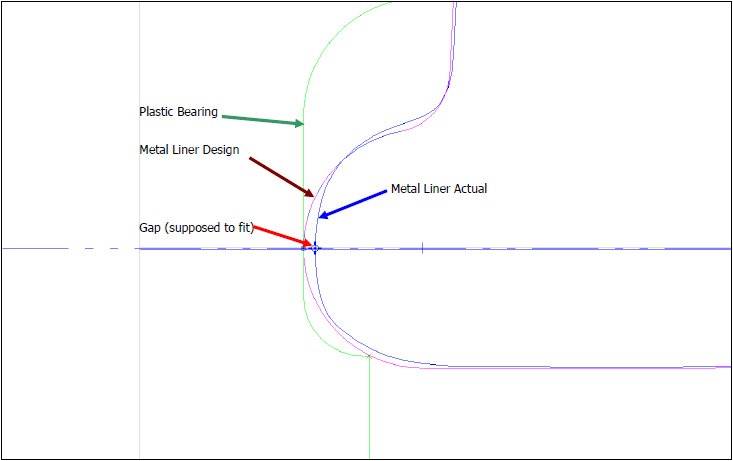 When considered together, the out of tolerance dimensions would weaken the capture mechanism between the metal inlay and the poly liner. In our professional opinion, these out of tolerance measurements caused or contributed heavly to the metal inlay escaping from the poly liner, which led to the catastrophic failure. The US National Institute for Standards & Technology is also the nation’s measurement laboratory responsible for ensuring accuracy and reliability of various measurement systems, applications and technologies. Our White Light Scanners conforms to NIST’s standards and have been produced and calibrated using NIST certified tools and traceable artifacts. Our quality management system is certified, assessed and approved by NQA against the provisions of ISO9001:2008 and AS9100 Revision C in accordance with the requirements of AS9104A. Scope of Registration: Computer Aided Quality Inspection, White Light Scanning, Product Modernization, CAD modeling and reverse engineering. Our 3D scanners . measurement processes, and operators are certified, assessed and approved against the provisions of AM44.9-2009 in accordance with the requirements of the American Association of Advanced Metrology. Scope of Certification: White Light Scanning and Computer Aided Inspection. THE INFORMATION CONTAINED IN THIS DOCUMENT IS PRIVILEGED AND CONFIDENTIAL. IT IS INTENDED ONLY FOR THE USE OF THE ENTITY NAMED ABOVE. YOU ARE HEREBY NOTIFIED THAT ANY DISSEMINATION, DISTRIBUTION OR COPYING OF THIS DOCUMENT IS STRICTLY PROHIBITED.